Santa Rosa de Copán, up in the mountains of western Honduras, is a wonderful small city with gorgeous vistas. We arrived on a Sunday morning and left early the next day with Max Elvir, Lenca Land Trails, so our impressions were brief and fleeting. As such, I can't do the city justice. Warren Post, owner of Pizza Pizza in Santa Rosa de Copan, graciously offered his ideas on things to do in his adopted home. Thanks Warren, for this page, for providing a critique of my Honduras vacation plans and for helping me understand better the country we loved visiting. The geographic and psychological heart of Santa Rosa is its historic downtown, a lovely place to stroll and admire the restored buildings and cobbled streets. Declared a national monument, the downtown area is restored and protected by the Santa Rosa Historical Preservation Commission. 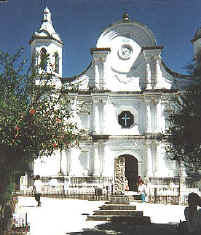 Although their web site is in Spanish, it is worth seeing if only to admire the many photographs of Santa Rosa's unique architecture. Santa Rosa is noted for the excellent hand rolled cigars produced by Flor de Copán, makers of the famous Zino line. The factory, located four blocks east of the bus station, offers guided tours (in Spanish) 7:30 - 11:30 a.m. and 1:30 - 4:30 p.m. Monday - Friday. There is a charge of US$2 per visitor. Be sure to take the factory tour while in Santa Rosa, even if you don't smoke. Cigars are available for sale at the factory outlet, which is two blocks west of the central plaza. My friend the cigar taster at the factory (yes, there really are a few people in this world who are paid to have jobs like that) recommends the Santa Rosa: mild but not light, well made, and won't harsh you out midway through. Just as Santa Rosa is famous abroad for its cigars, it is known among Hondurans as a center of cultural activity. The city cultural center (Casa de la Cultura, 1/2 block south of the central plaza) offers a library, frequent exhibitions, performances, readings, and concerts. Be sure to ask about upcoming events. Coffee lovers will want to visit Beneficio Maya, where fine coffee is graded and roasted for export. Aside from being able to view the process, visitors can buy fresh export grade coffee. Take a taxi to the beneficio, as it's a little hard to find. There is usually something to see year round, although most activity takes place during coffee harvest season (October - February). Ten minutes outside of town on the road to Gracias is the village of La Montañita. There you will find Doricentro, a privately operated park with water toboggan, swimming and wading pools, light snacks and beverages, picnic areas, and music. An entrance fee of US$1.50 includes use of the toboggan and pools. Doricentro is open weekends and holidays. Further along the road to Gracias is Las Tres Jotas (US$0.75), another private park that is also a working tobacco farm and fishery. Have the bus driver point it out, as the sign on the highway is easy to miss. Aside from picnic areas and wading pools, Las Tres Jotas has the freshest fish you'll eat. Las Tres Jotas is open daily and welcomes overnight campers. A very special time to visit Santa Rosa is during Easter Week. During the week before Easter, Santa Rosa presents some of the best processions in the nation. Six in all, the processions are full dress street theater reenactments of the different parts of the Easter story daily beginning Holy Thursday. There's the Incarceration Procession, the Holy Cross Procession, the Funeral and Mourning Processions, the Resurrection Procession, and more. The most spectacular is undoubtedly the Holy Cross Procession, or Via Crucis, on Friday morning. Bearing cross and under guard, Jesus makes his way through the heart of Santa Rosa's historical district along a two kilometer route beautifully decorated with carpets of flowers and colored sawdust in the streets. Because the carpets are ruined by the passage of the procession, you will want to arrive well before the nine a.m. starting time to admire the handiwork of the many Copanecos who have labored since dawn on the decorations. My personal favorite, however, is the candlelight Women's Procession Friday night. Mary and her friends march silently through the dark streets in mourning for her son's death, the only sound their footfalls on the cold cobblestones. Another good time to visit Santa Rosa is during the annual fair in the last two weeks of August. 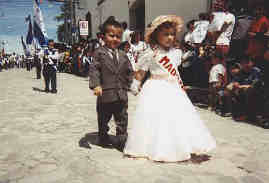 Dedicated to the local patron saint, Santa Rosa de Lima, there are religious observances, a beauty pageant and coronation, street carnivals, a rodeo, cultural performances, and more. Honduras's Independence Day, September 15, is marked by three days of celebrations and parades with surprisingly intricate uniforms and costumes. Each year schools compete to see which can display the most striking or unique presentation. Kindergartens march on September 13, elementary schools on September 14, and high schools on September 15. There are also volunteering opportunities in Santa Rosa de Copán. The cultural center downtown can always use volunteers. You could pretty much write your own position description there, but some ideas are: dance instruction (ballet or modern), music (band/orchestra), drama, photography, painting... well, you get the idea. Interested? Email the cultural center (casadelacultura @ hotmail.com) for more information. The La Roca community center is always seeking volunteers who are willing to commit at least two months. Currently the center is looking for volunteers to teach classes like crafts and English and to coordinate sports programs in basketball and volleyball for girls and soccer for boys. Spanish definitely helps, but is not absolutely necessary in these particular activities. Email the center (Phil @ timko.ca) for more information. Warren Post first arrived in Honduras in 1986 as a diplomat assigned to the U.S. embassy in Tegucigalpa, and returned to stay in 1990. Since then Warren has occupied himself as a beach bum in Trujillo, a marketing director for a ecotour operator, an English teacher on a cattle ranch, a cybercafe owner, a jungle guide in the Mosquitia, and a web designer and IT consultant. In 1994 he and his Honduran wife Orlanda opened Pizza Pizza, a family restaurant in Santa Rosa de Copan, which they continue to operate with their three teenage sons. Warren's website is packed full of information. Make sure you visit his page on day trips around Santa Rosa de Copan.